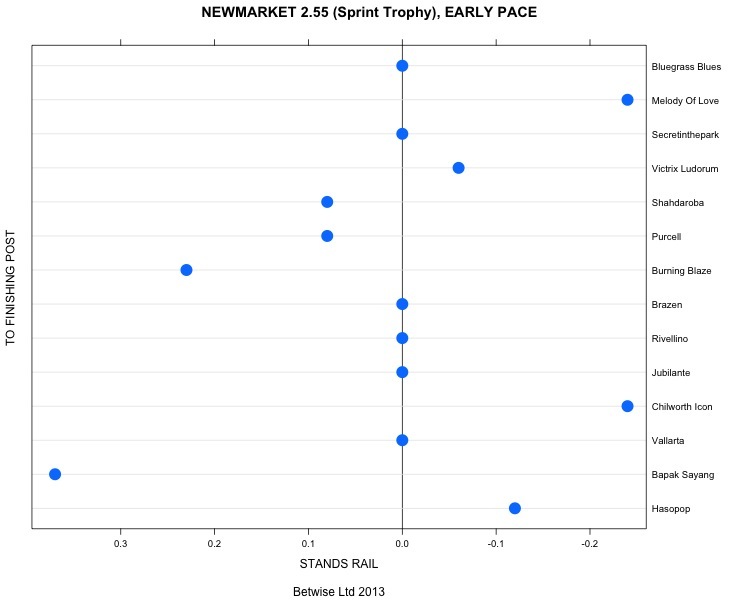 Following on from last week’s post about visualising pace in the race, here’s another pace chart painstakingly crafted for today’s big sprint at Newmarket. As with Ascot last week, you can see that at Newmarket the horses run from right to left if we are looking from the stands side (the usual television angle) of the course. Thus Hasopop is in stall 16 and BlueGrass Blues, running towards the far (or “inside”) rail, is in stall 1. Non-runners Lewisham and Heaven’s Guest (at the time of posting) have been removed. So the pace in the race is definitely with Bapak Sayang towards the stands rail. This colt has a great draw for a front runner in stall 15 in that he may be able to bag the rail early to run against and dictate the pace of the race. The bad news is that Newmarket’s wide, straight galloping course has not got the best strike rate for front runners with ambitions to win. There also has to be a caveat that this horse has only had 5 runs so it might be a little early in his career to label him a persistent front runner. If you like the graph, or anything needs clarifying, please let us know in the comments section. Check out this pace graphic (just one of the things it’s possible to do with Smartform and a little programming). Every day we produce leader and lagger statistics in the Betwise Members’ area – this graphic shows the difference between the two as “net lead” – if a horse is in the negative part of the graph, we expect them to start slowly, a horse in the positive part of the graph shows a probable early leader, and the extent to which they will lead. Everything else is as you will expect to see in the race – horses are ordered according to the draw, from Solar Deity on the stands rail in stall 1 to Born to Surprise racing in stall 29 on the near side rail. Ascot’s a right handed course, so the horses are racing from right to left if you look at the course from above. Therefore this is like an aerial view of the racecourse and shows us which horse(s) we might expect to be leading after the first furlong of the race, where the horse’s position is represented by the blue dot. Of course, the dynamics of the race mean that the horses will start to bunch and will not stay in “lanes” once they have started, also it’s usually the horse that actually gets the lead that matters most (our prediction is Dream Tune in this case). If you like this graphic or would like to see anything else explained or added to it, please let us know in the comments section. 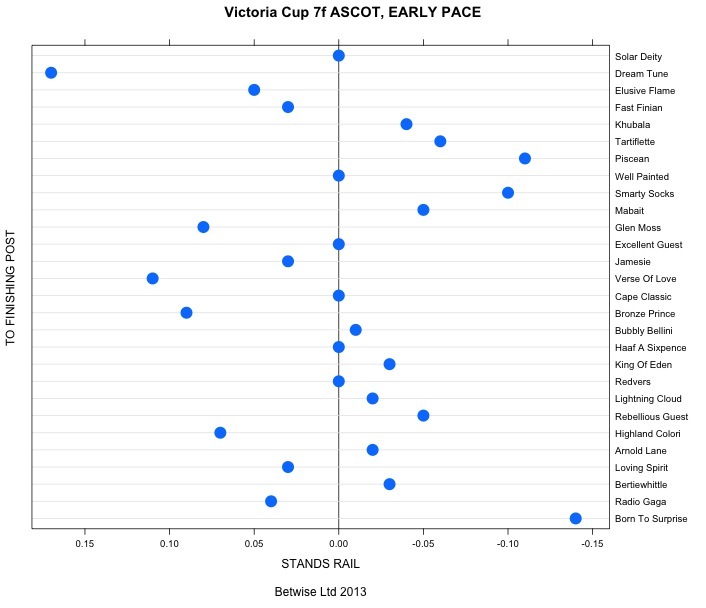 The early pace looks to be towards the stands side, with Dream Tune looking highly likely to secure an early lead. A good back to lay candidate?